Posted this in Critiques and Techniques first, but that was probably the wrong forum for comments on such a basic photo. 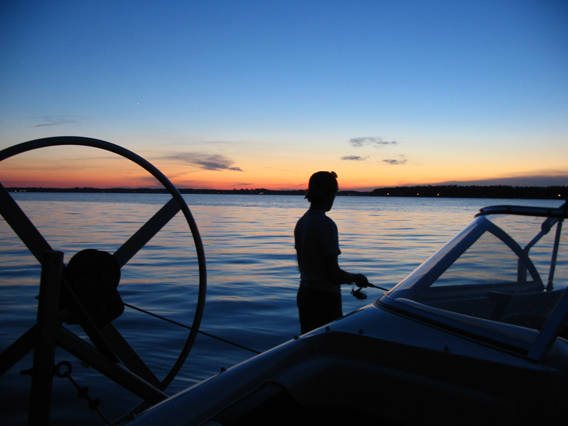 I took this with my Canon A85 in late July, just before sunset.It's a buddyfishing at the end ofthe cottage dock and hehad no ideaI was taking the picture. I don't recall the mode or settings, but I shut the flash off andrestedmy elbowson the bow of the boat, which was already up on the lift. Ahh...what a life. Nice late afternoon scene. I thought the critique and techniques forum is where you really learn? It seems to me people who seek to improve post on that forum. The C&amp;T forum seems to be where people ask for input, mostly complicated stuff, so I can see why no one posted about my photo. I was actually wondering what people thought, not really looking for ways to improve it. I'm a casual/amateur photographer I guess, and I wondered if people would like the photo as much as I do, that's all. Of course I'm biased about a place associated with my own memories.